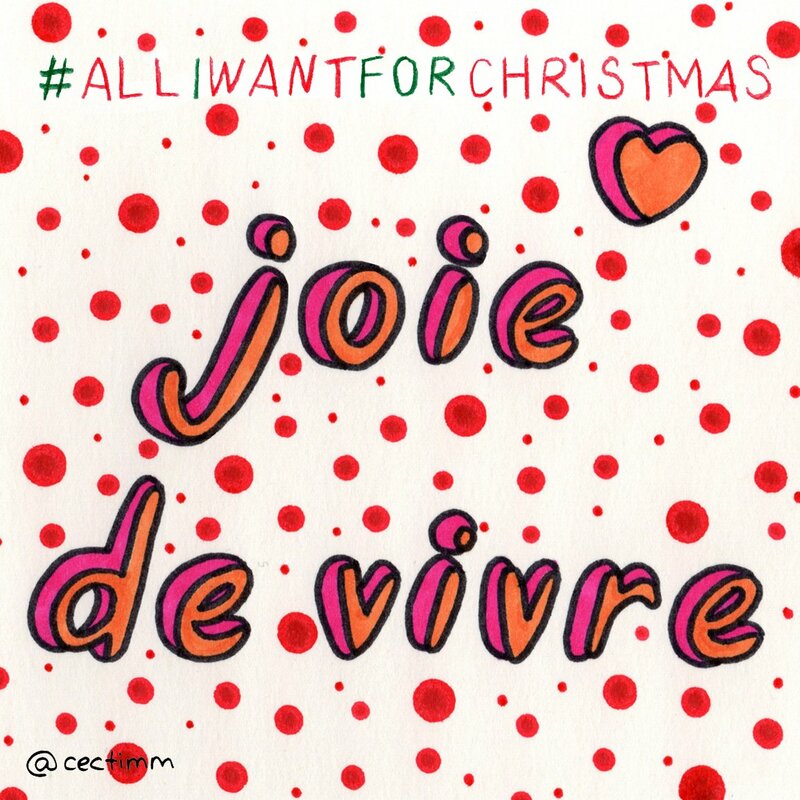 #adrawingaday #AllIWantForChristmas Joie de vivre ♥ This French phrase is often used to express the cheerful enjoyment of life. This is going to be my motto in 2019... OMG, WHEN DID IT BECOME 2019?!? WTF! If you need me I'll be rocking back and forth in the corner. This expression of spirit is a reminder to appreciate and enjoy the little things in life... to find beauty and joy in the mundane, pedestrian, dark and even difficult times. We all need to reach down into our hearts and pull out a little bit of joy for us to experience and share. Viva joy! If you would like to purchase a drawing or commission a portrait, please get in touch. 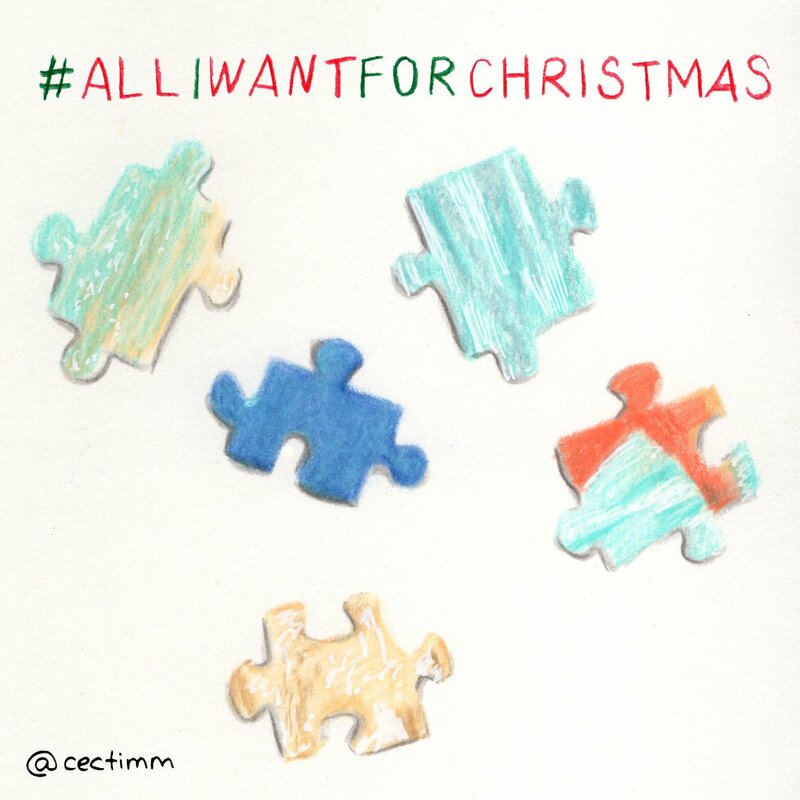 #adrawingaday #AllIWantForChristmas I love a good puzzle... they're good for the soul, a great opportunity to spend time alone or catch up with family and friends and they help me practice my observation and memory skills. So much good can come out of a simple puzzle. Basically getting a photo and chopping it up into pieces is an excellent way to challenge yourself ♥ Here's to more puzzle time in 2019! If you would like to purchase a drawing or commission a portrait, please get in touch. 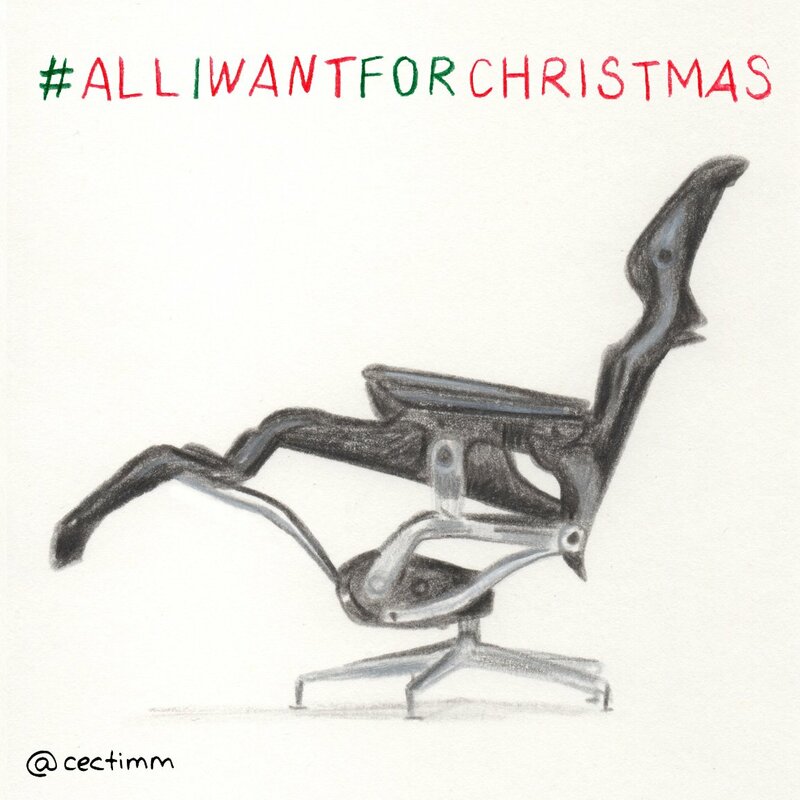 #adrawingaday #AllIWantForChristmas I dream of having an office setup that fits me just right ♥ I can't sit or stand for long periods of time because of foot and leg pain. My life would be so much better if I had an amazing office setup where my legs could be elevated for big chunks of time. How sweet it would be! If you would like to purchase a drawing or commission a portrait, please get in touch. 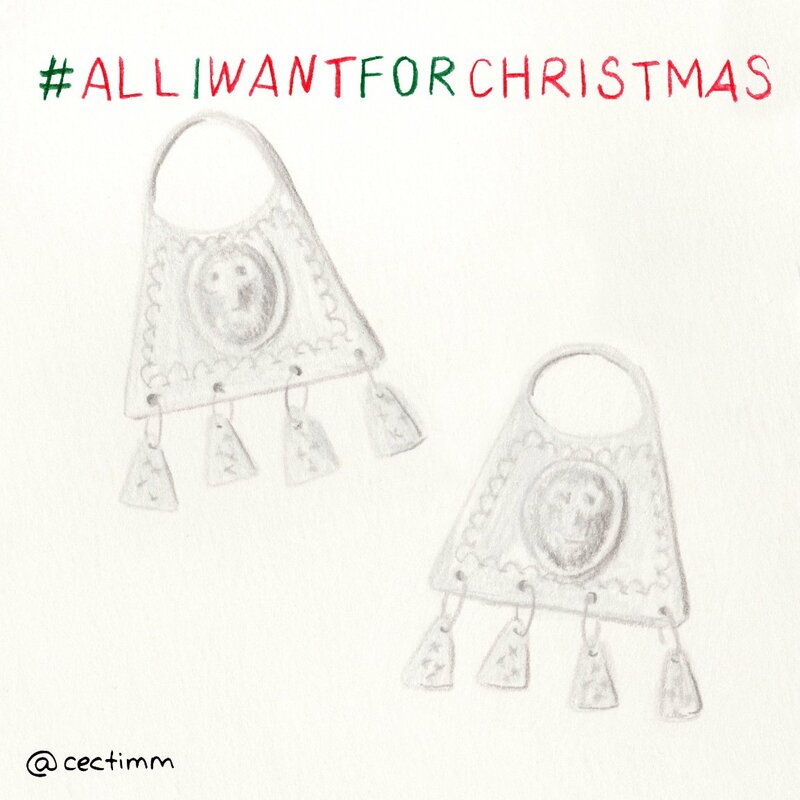 #adrawingaday #AllIWantForChristmas I adore interesting and unusual jewellery and with a trip to Chile in my very near future, I am looking forward to finding some beautiful pieces ♥ I am really looking forward to finding some handmade Mapuche jewellery in the south of Chile. The Mapuche are an indigenous culture from the south of Chile and Argentina. Their jewellery is made from silver and is made from tubes, small beads, plates and chains. Watch this space for purchase updates :P If you would like to purchase a drawing or commission a portrait, please get in touch. 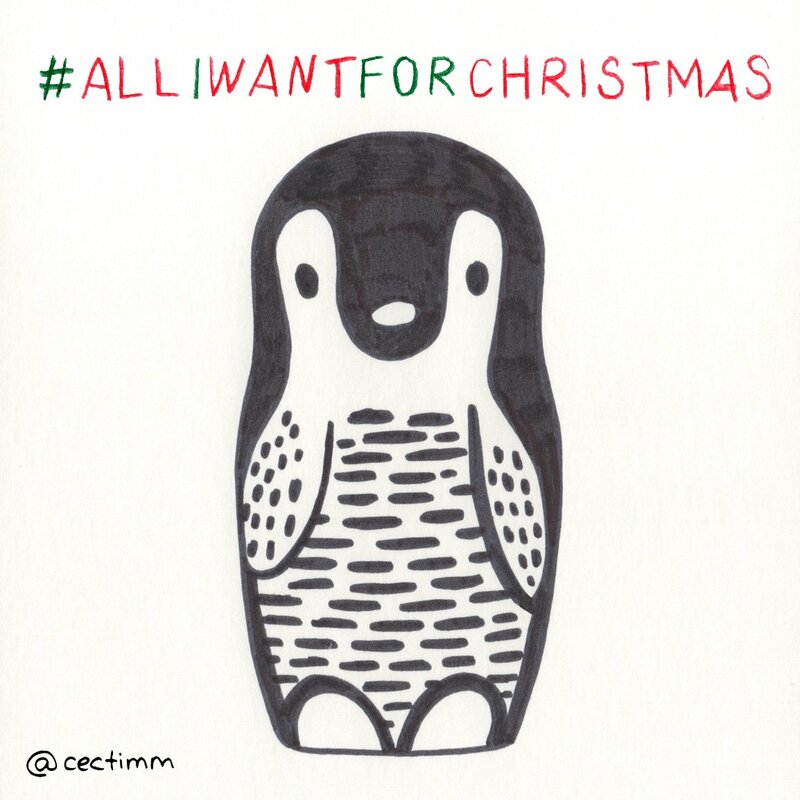 #adrawingaday #AllIWantForChristmas I want to be free with my creativity ♥ I am very calculated with my artwork. Everything is planned precisely and I labour over ideas long before pencil or brush meets paper. 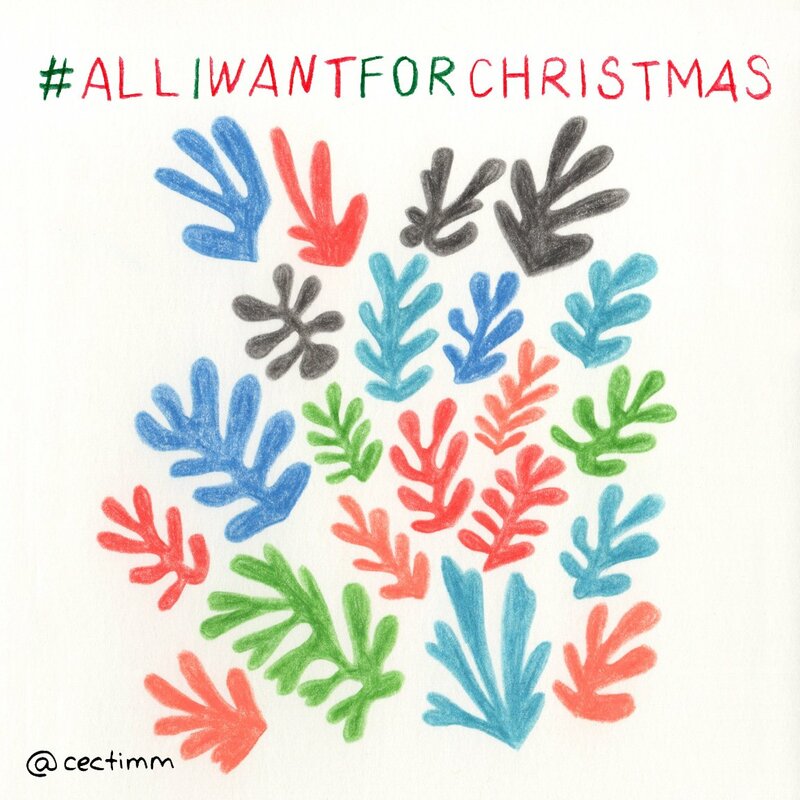 I admire the freedom of the masters like Henri Matisse (this is based on his 1953 work La Gerbe) who could create free organic shapes with no desire to represent real life. I wish to be able to create more unconsciously and less methodically... here's to letting go in the new year. If you would like to purchase a drawing or commission a portrait, please get in touch. 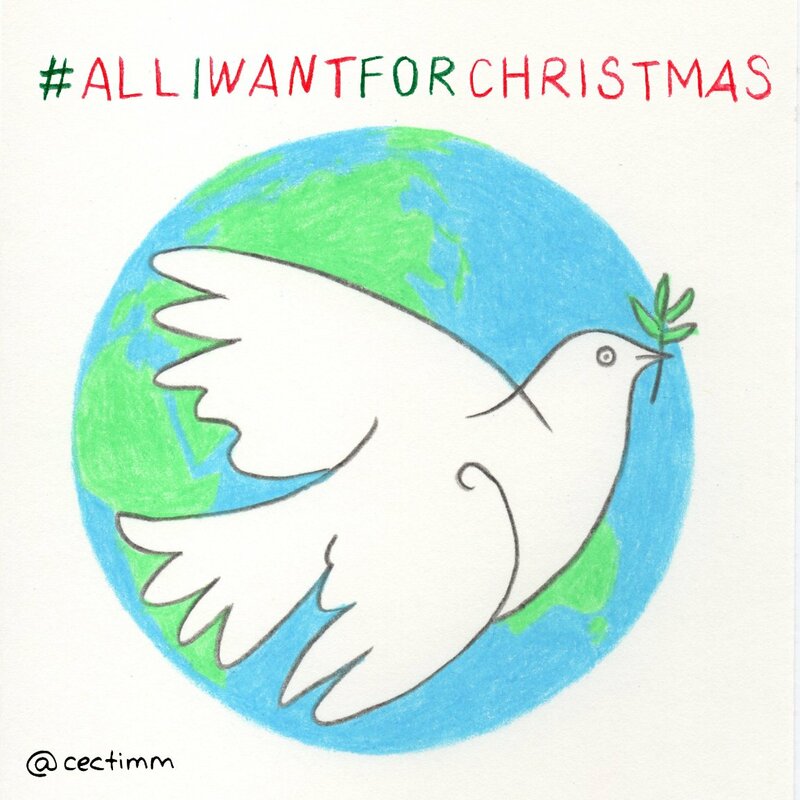 #adrawingaday #AllIWantForChristmas Word peace ♥ Peace on earth ♥ An end to all wars ♥ Universal love ♥ Give peace a chance I know this is a long shot and it's not likely to ever happen but I wish with all of my heart that one day people will stop hating and start loving each other. Merry Christmas to all and to all a heart brimming with love ♥ This is inspired by Picasso's peace dove... I love the simplicity of this bird as love and peace is really that simple. If you would like to purchase a drawing or commission a portrait, please get in touch. #adrawingaday #AllIWantForChristmas I adore Matryoshka dolls ♥ You may also know them as Babushka, nesting or Russian nesting dolls. A doll within a doll, within a doll. What's not to love. I love the more unusual Matryoshka dolls... the brightly coloured, quirky character and bespoke kind. This is doll #2 of a 3 doll set that includes a racoon, panda and penguin. So cute. I can't get enough of these quirky little creatures. If you would like to purchase a drawing or commission a portrait, please get in touch. 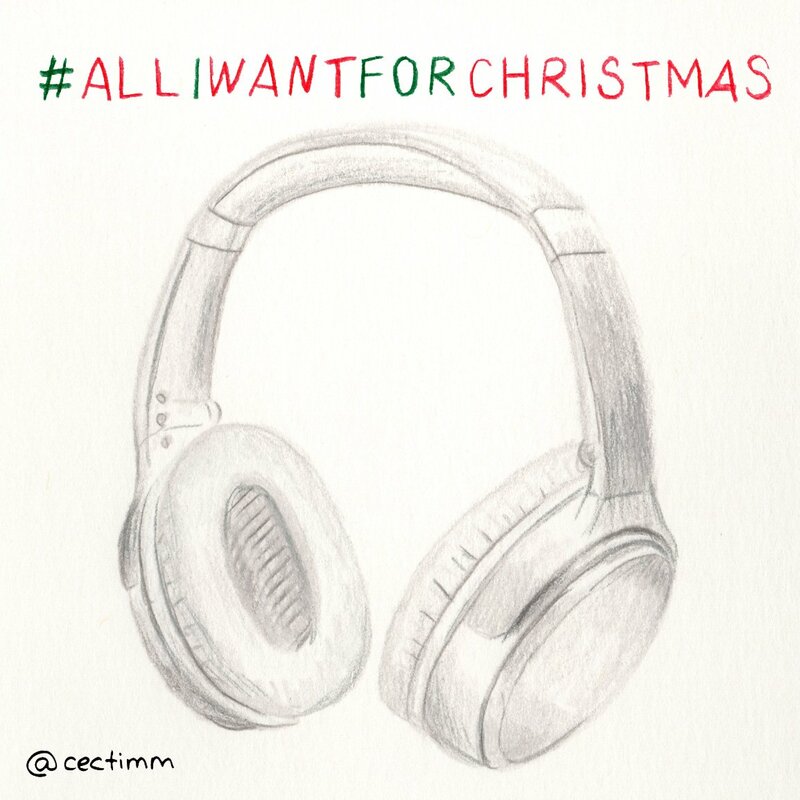 #adrawingaday #AllIWantForChristmas I really love music and I listen to loads of podcasts. A lot of the time I'm on my own but when I'm around people it's great to have a headphone option. My Beats are getting a bit old and let's face it wires are so 2008. How amazing is it to zone out and lose yourself in the moment, the music... you only get one shot, do not miss your chance to... I digress ♥ How cool are these Bose QuietComfort 35 wireless headphones in silver... what a great way to lose yourself in the music. VIVA music! If you would like to purchase a drawing or commission a portrait, please get in touch. 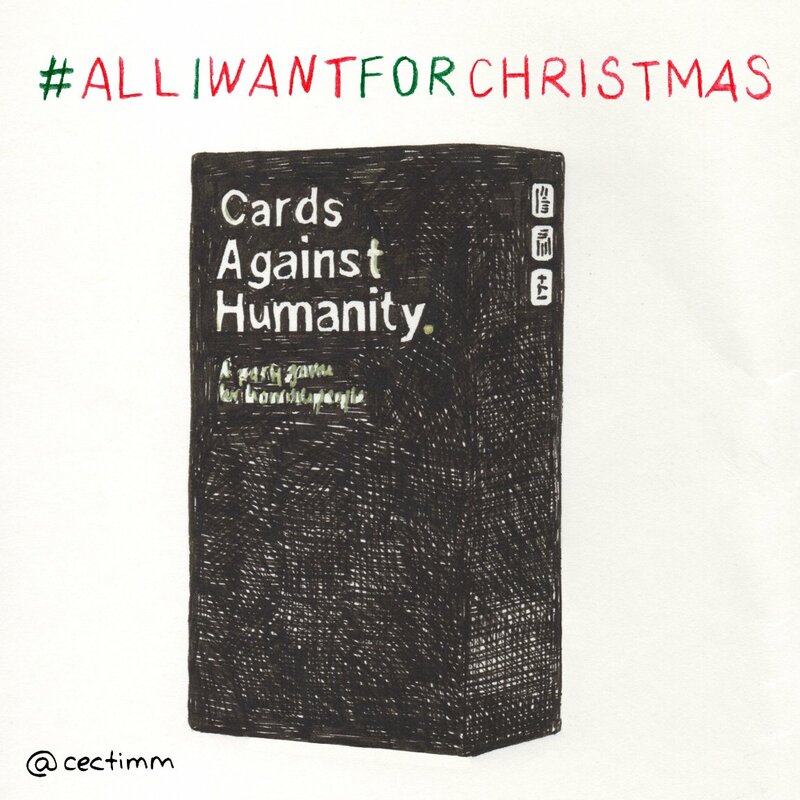 #adrawingaday #AllIWantForChristmas We play a lot of games in our family... Canasta, Escoba, Tantrix and Kings Corners to name a few ♥ We have never played Cards Against Humanity and apparently it's hilarious. I think we need this to take our gameplay to the next level LOL. We all need to play more games! If you would like to purchase a drawing or commission a portrait, please get in touch. 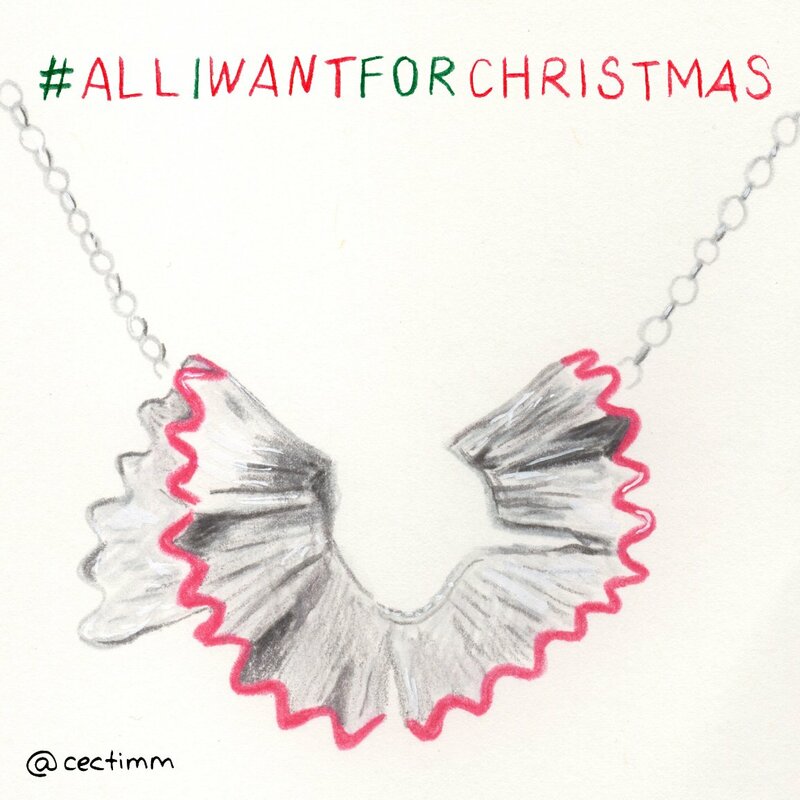 #adrawingaday #AllIWantForChristmas I love jewellery but I'm not really a Michale Hill kind of gal. I like my jewellery a little bit more bespoke and artsy and there's nothing cuter than this gorgeous pencil shaving necklace by Victoria Mason Collections. Considering I use pencils every day and generate pencils shavings at an alarming rate there really is no better match for me than this Sharpening Necklace ♥ It's on my must-have for 2019. Divine! If you would like to purchase a drawing or commission a portrait, please get in touch. 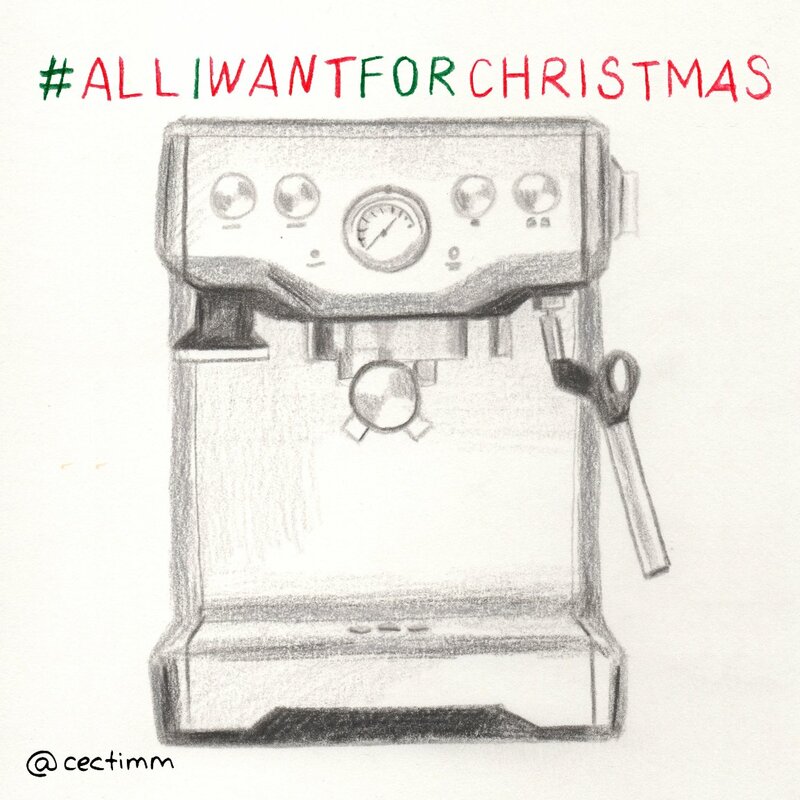 #adrawingaday #AllIWantForChristmas Despite the fact that I'm allergic to caffeine, I love coffee ♥ I drink decaf coffee and I can no longer bring myself to use my Nespresso pods. I feel guilty about the aluminium pods even though I have always recycled them. I really want a proper coffee machine even if it's a small one. It doesn't make sense in boiling an espresso maker pot on the stove for just one cup. Imagine all of the coffee art I could do LOL. If you would like to purchase a drawing or commission a portrait, please get in touch. 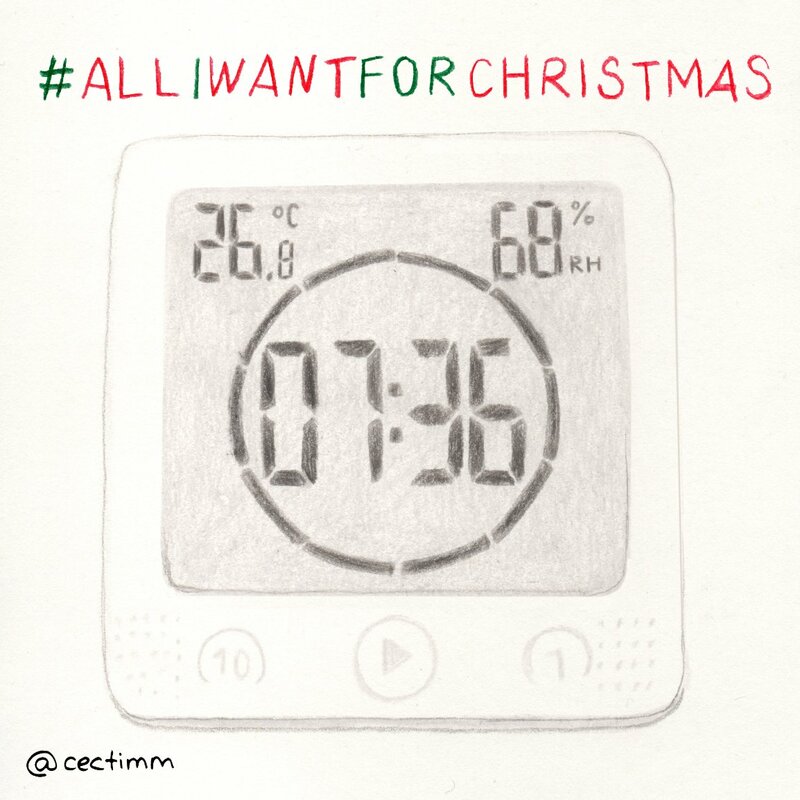 #adrawingaday #AllIWantForChristmas I listen to a lot of podcasts and a heap of music and I want to keep listening when I get into the shower. I want to have - if they are available - a waterproof and wireless blue tooth speaker/clock-radio so I can play my tunes and keep my showers short so I can do my bit for the environment ♥ How handy would that be! Duf duf in the shower. If you would like to purchase a drawing or commission a portrait, please get in touch. 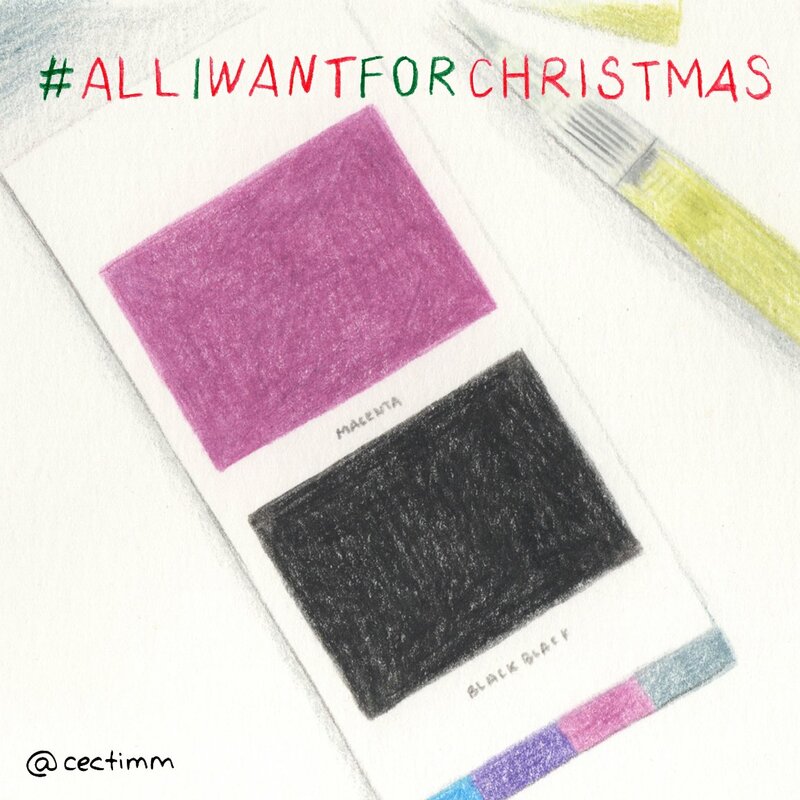 #adrawingaday #AllIWantForChristmas I haven't tried these but I really want them... Viviva colour sheets ♥ Unlike other watercolour paint pallets, they are flat sheets with watercolour pigment on them that you can pick up with a water-filled brush. They look like loads of fun and come in a beautiful array of colours. They take paint portability to the next level. Anything that makes art accessible and easy is a great thing. If you would like to purchase a drawing or commission a portrait, please get in touch. 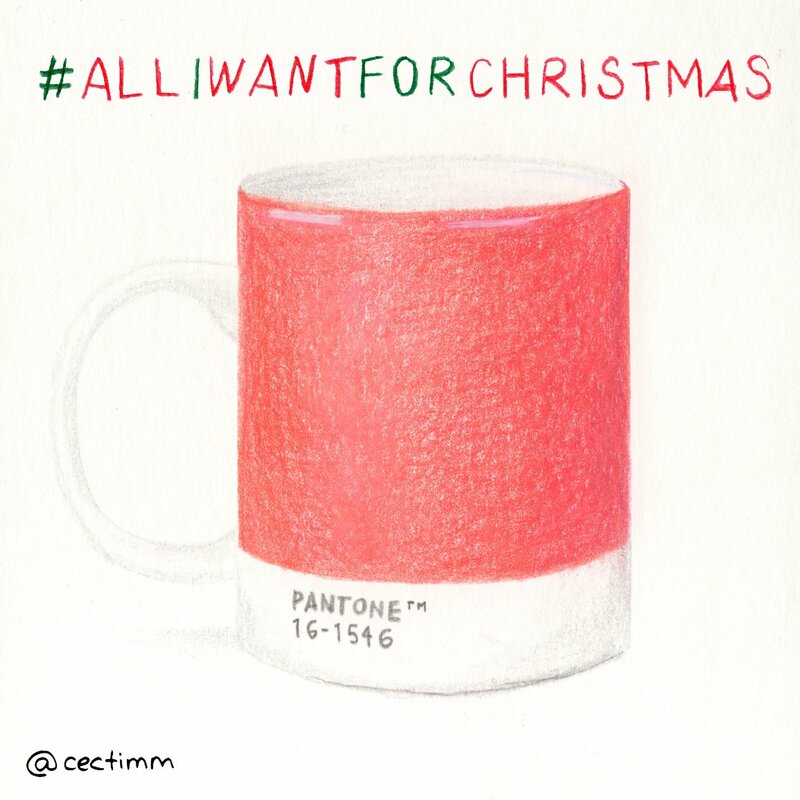 #adrawingaday #AllIWantForChristmas I love my Pantone cups ♥ I have a few different colours. This year's Pantone colour has just been released and it's 16-1546 Living Coral. What a gorgeous golden shade of orange. It's hard to capture the colour with coloured pencils so I've tried to blend a few. I guess when I eventually get my own cup I'll know how close I got it :P If you would like to purchase a drawing or commission a portrait, please get in touch. 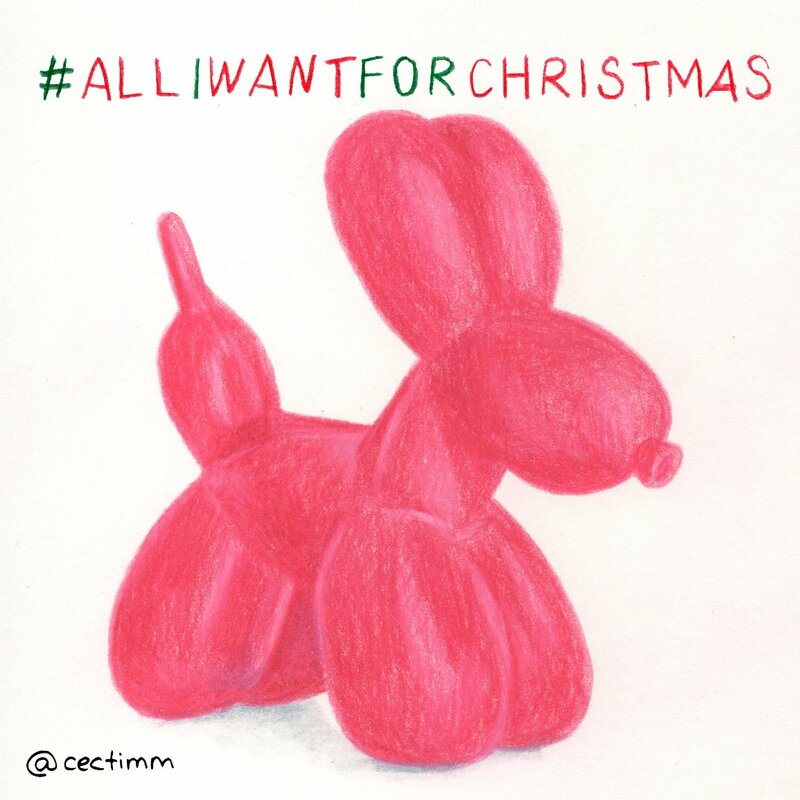 #adrawingaday #AllIWantForChristmas I love almost anything pink and I really love poodles ♥ I came across this gorgeous night light online that looks like a poodle balloon animal and it's an amazing pink. How awesome would this look lit up at night! I would love a gigantic version of this as a sculpture in my home. Viva pink poodles! If you would like to purchase a drawing or commission a portrait, please get in touch. 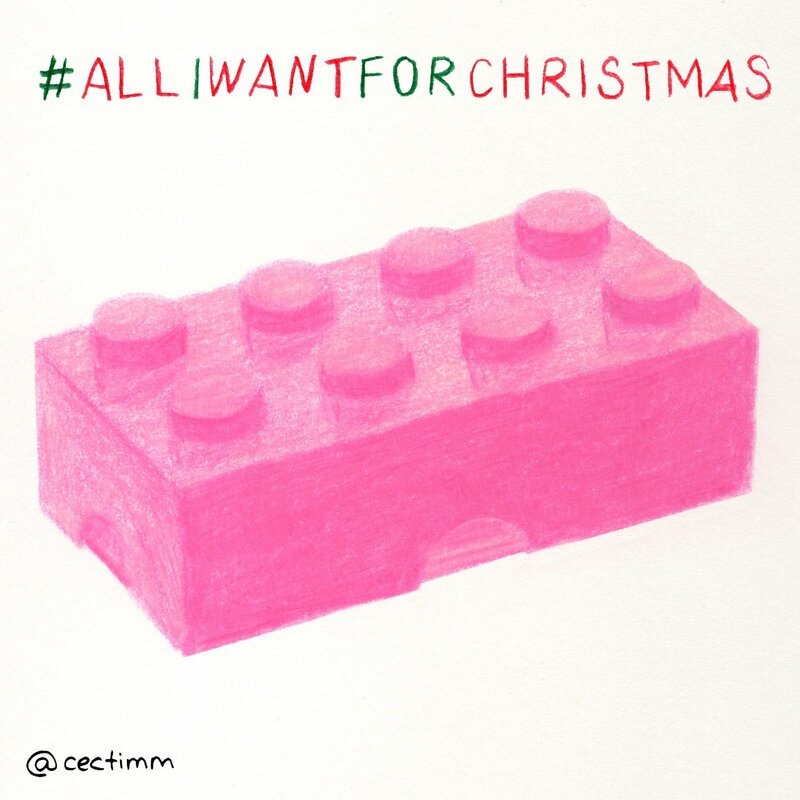 #adrawingaday #AllIWantForChristmas I love Lego but I don't really build it nowadays. I have seen these awesome Lego storage boxes and I think they would look super awesome in my studio ♥ Pink + Storage... what else does a girl need? If you would like to purchase a drawing or commission a portrait, please get in touch. 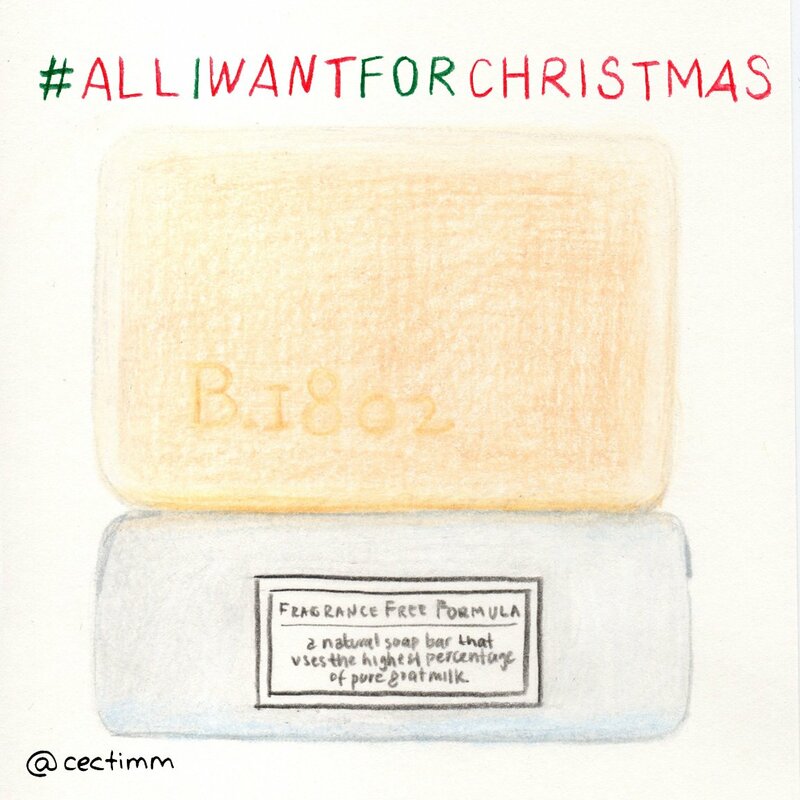 #adrawingaday #AllIWantForChristmas This one is a bit traditional and perhaps a bit boring but I like soap ♥ Not all soap though... I have a bunch of allergies and I hate smelly cosmetic products so I have a pension for luxury natural soaps that don't have a lot of fragrance. Sheep and goats milk bars of soap are so creamy and moisturising and my dry sensitive skin really loves them. Thinking green, imagine if everyone used natural soap wrapped in paper... the impact of the bottles used for liquid soap on the environment is tremendous. Let's all make our way back to bar soap... let's make soap great again! If you would like to purchase a drawing or commission a portrait, please get in touch. 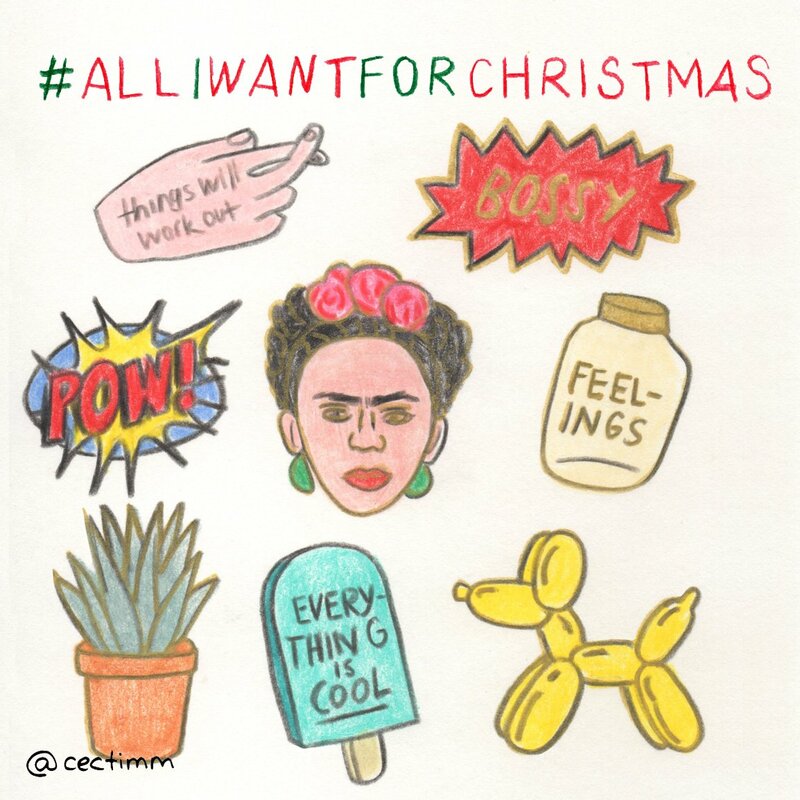 #adrawingaday #AllIWantForChristmas Pins Pins Pins ♥ I love pins! I have a denim jacket that has so many pins on it that it's becoming quite heavy. I made this jacket because I wanted to... I always wanted a denim jacket with loads of pins on the front. This jacket has kind of taken on a life of its own and I often get stopped in the street by people wanting to talk about the jacket and a few have offered to buy it. I still want more pins though... there are so many great ones and I don't have any of these cool ones yet. Viva la pins! If you would like to purchase a drawing or commission a portrait, please get in touch. 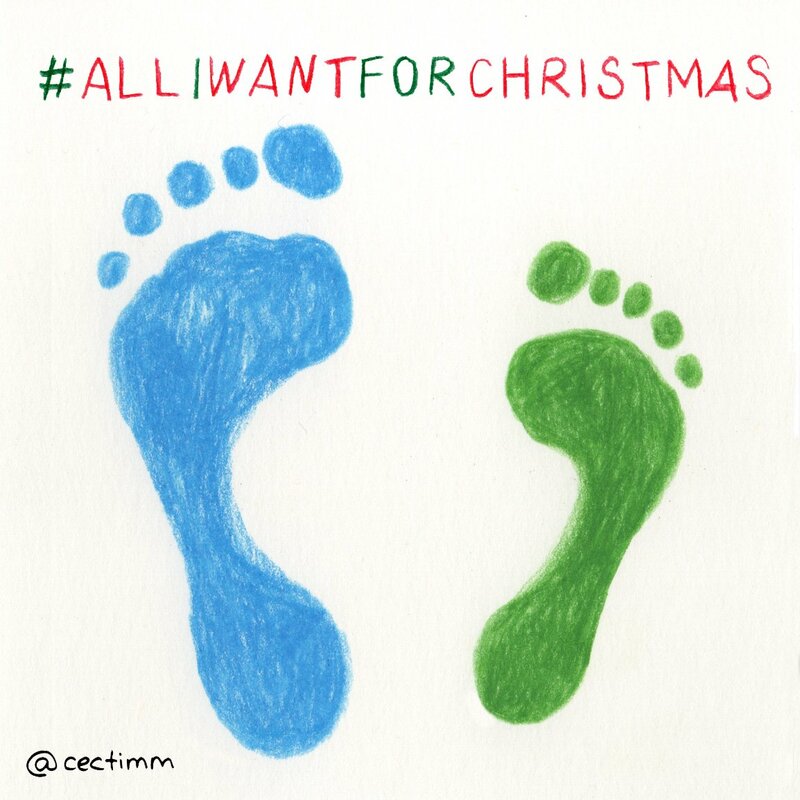 #adrawingaday #AllIWantForChristmas I always have brightly coloured toenails ♥ It's kind of my thing. It's very strange for me to head out into the world with naked toes. When I was in Hawaii I got one bottle of Pop nail polish and it has been the longest lasting and brilliantly bright polish I've ever had. I only redo my toenails when they've grown out too much to look pretty anymore as it doesn't chip. I have tried to buy them online but they always sell out of the best colours or they won't post to Australia. 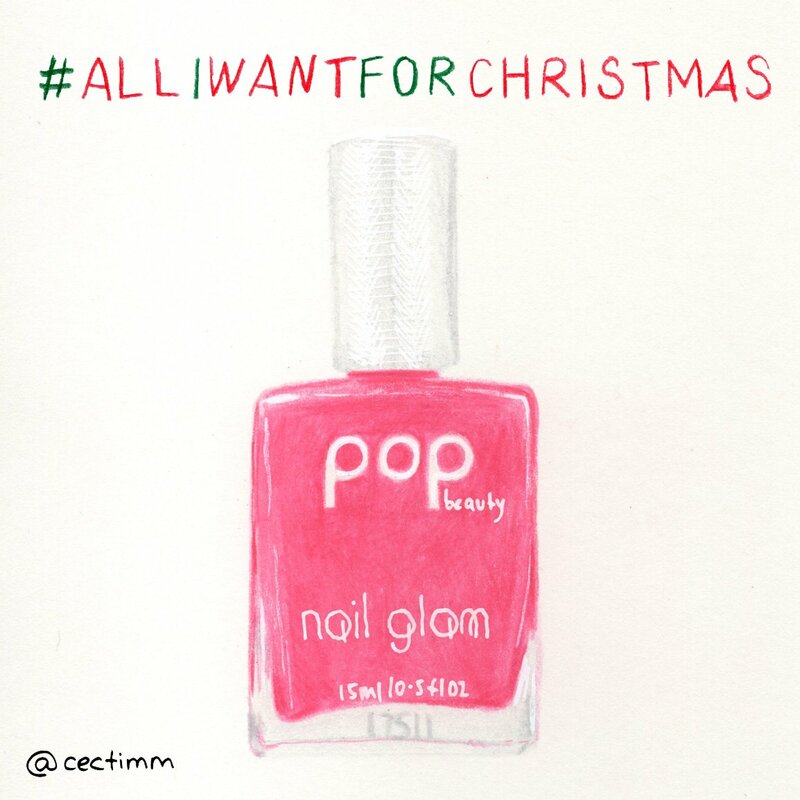 So feel free to buy, send or give me the best bright, fluoro or out there coloured nail polish. Life is too short to be boring :P If you would like to purchase a drawing or commission a portrait, please get in touch.